As a teenager living in Belfast, I admired the American Peace Movement and many prominent figures within it. Fifty years later, two of the most inspiring people still remembered across the world are Americans: Martin Luther King and Dorothy Day. American peace activists and civil rights workers were imprisoned, some killed. But a generation spoke and sang about love. Like Mahatma Gandhi in India, the Berrigan Brothers in the Peace Movement and the American Civil Rights Movement show us that the path to freedom and equality is a peaceful one. This journey of transformation in the pursuit of peace and justice is a constant challenge to the entrenched powers which thrive on hatred and war; acting as a constant challenge to blind prejudice and the lies that are necessary for war. In making this journey of love we must always acknowledge that those we regard as enemies are fellow human beings and we are called to love them . If we don’t, when do the killing fields stop? I first came to you from Northern Ireland to speak to you about what was happening in my country. I was met with great kindness in America. Now I write to you to about Syria. We must not allow a war to go on for decades, as many did in regards to Ireland. We must have the foresight to stand up for peace, nonviolence and reconciliation now, before the suffering is entrenched and before prejudices and lies seep deeply into the consciousness of a new generation, acting as seeds for more yet more war. I write to you to ask your help for the people of Syria. All the people of Syria deserve your attention. Like you, they want the opportunity to live, love and labour in support of their children’s dreams. With your efforts we can make it a bright future in a peaceful and prosperous country where love will conquer all. The people of Syria are a diverse people, a courageous and generous people with a proud history of tolerance. Over many centuries, their country has welcomed millions of disparate people seeking refuge just as the United States has done. I visited Syria in May 2013. Despite the on-going violence, I found it to be a land of hope. I met tribal and religious leaders, political dissidents and grieving parents and widows. In Syria, there are millions of ordinary folk risking their lives for a peaceful, reconciled and united Syria they can all love. Mother Agnes Mariam, one of the leaders of the Mussalaha (reconciliation) Movement in Syria, is on a speaking tour of America this November. 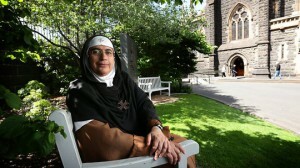 Mother Agnes Mariam has sat at a table with the prime minister of Syria has and has eaten olives with a rebel leader. And recently she risked her life to negotiate the safe passage of thousands of civilians and of many fighters from a conflict zone. Your heroes, the heroes we all uphold, show us bridges of nonviolence and peace must be built between people. War stems from hatred and lies. Peace requires courage, wisdom, and love. And foresight. Mother Agnes is bringing to America a universal message your country knows well. She presents it through the story of Syria. I encourage you to hear this story. Mother Agnes will be touring the U.S. and Canada from October 24, to December 4, 2013 under the auspices of the Syria Solidarity Movement (SSM). If requested, Mother Agnes will also be happy to speak about the conditions of Arab and other Christian communities throughout the Middle East. On November 1 Mother Agnes-Mariam of the Cross arrived in Tucson, Arizona after a 31-hour trip from Beirut, Lebanon, and gave her first radio interview to Peter Phillips and Mickey Huff, co-directors of the widely acclaimed “Project Censored” and hosts of a popular KPFA radio program. In the interview, she described her peacemaking work, responded to critics, and outlined the intentions of her North America tour.